Ever shrinking transistors are the key to faster and more efficient computer processing. Since the 1970s, advancements in electronics have largely been driven by the steady pace with which these tiny components have grown simultaneously smaller and more powerful—right down to their current dimensions on the nanometer scale. But recent years have seen this progress plateau, as researchers grapple with whether transistors may have finally hit their size limit. High among the list of hurdles standing in the way of further miniaturization: problems caused by "leakage current." In a highly interdisciplinary collaboration, researchers across Columbia Engineering, Columbia University Department of Chemistry, Shanghai Normal University, and the University of Copenhagen have upended conventional wisdom, synthesizing the first molecule capable of insulating at the nanometer scale more effectively than a vacuum barrier. Their findings are published online today in Nature. "We've reached the point where it's critical for researchers to develop creative solutions for redesigning insulators. Our molecular strategy represents a new design principle for classic devices, with the potential to support continued miniaturization in the near term," said Columbia Engineering physicist and co-author Latha Venkataraman, who heads the lab where researcher Haixing Li conducted the project's experimental work. Molecular synthesis was carried out in the Colin Nuckolls Lab at Columbia's Department of Chemistry, in partnership with Shengxiong Xiao at Shanghai Normal University. The team's insight was to exploit the wave nature of electrons. By designing an extremely rigid silicon-based molecule under 1 nm in length that exhibited comprehensive destructive interference signatures, they devised a novel technique for blocking tunnelling conduction at the nanoscale. 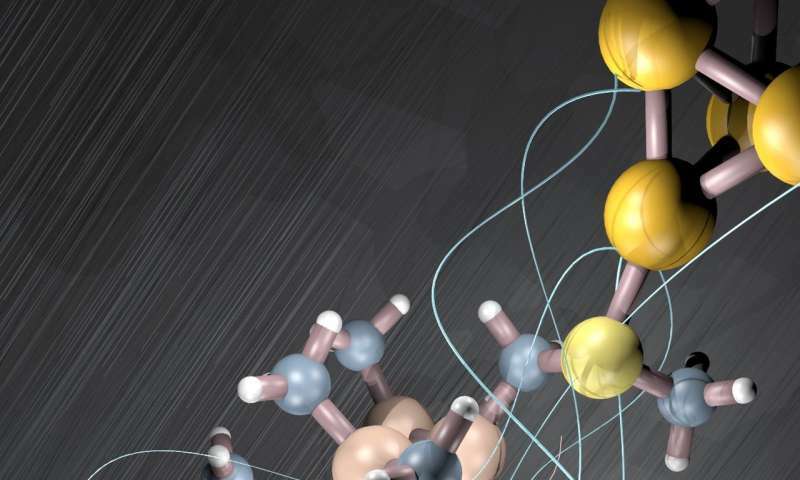 "This quantum interference-based approach sets a new standard for short insulating molecules," said lead author Marc Garner, a chemist in the University of Copenhagen's Solomon Lab, which handled the theoretical work. "Theoretically, interference can lead to complete cancellation of tunneling probability, and we've shown that the insulating component in our molecule is less conducting than a vacuum gap of same dimensions. At the same time, our work also improves on recent research into carbon-based systems, which were thought to be the best molecular insulators until now." Destructive quantum interference occurs when the peaks and valleys of two waves are placed exactly out of phase, annulling oscillation. Electronic waves can be thought of as analogous to sound waves—flowing through barriers just as sound waves "leak" through walls. The unique properties exhibited by the team's synthetic molecule mitigated tunneling without requiring, in this analogy, a thicker wall. "Congratulations to the team on this breakthrough," said Mark Ratner, a pioneer in the field of molecular electronics and professor emeritus at Northwestern University who was not involved in the study. "Using interference to create an insulator has been ignored up to this date. This paper demonstrates the ability of interference, in a silicon-based sigma system, which is quite impressive." This breakthrough grew out of the team's larger project on silicon-based molecule electronics, begun in 2010. The group arrived at their latest discovery by bucking the trend. Most research in this field aims to create highly conducting molecules, as low conductance is rarely considered a desirable property in electronics. Yet insulating components may actually prove to be of greater value to future optimization of transistors, due to the inherent energy inefficiencies caused by leakage currents in smaller devices. "This work has been extremely gratifying for us, because in the course of it we have repeatedly discovered new phenomena," said Venkataraman. "We have previously shown that silicon molecular wires can function as switches, and now we've demonstrated that by altering their structure, we can create insulators. There is a lot to be learned in this area that will help shape the future of nanoscale electronics." The study is titled "Comprehensive suppression of single-molecule conductance using destructive sigma interference."